Homepage. This page: A letter issued by H & G Robinson (Gosforth) Ltd, re: the pre-war range of Packard automobiles. This original letter, signed by E.O. Duggan of H. & G. Robinson (Gosforth) Limited, introduces the range of Packard motor-cars to whoever it was sent out to. As there is no destination address given, I assume this was a stock letter send out to anyone who expressed an interest in buying one of their motor-cars, perhaps after a visit to a motor-show. The letter is dated 27th May 1938. The Packard Motor Car Company has for years been selling more high quality cars than any other three manufacturers combined, and has been producing quality cars for nearly forty years. Packard car sales over the last four years show the greatest percentage increase of any car selling in England. Packard has been established in England for over twenty years and now gives direct employment to over 300 people. The value of Packard spare parts kept in stock in England for the convenience of Packard owners approximates £20,000. 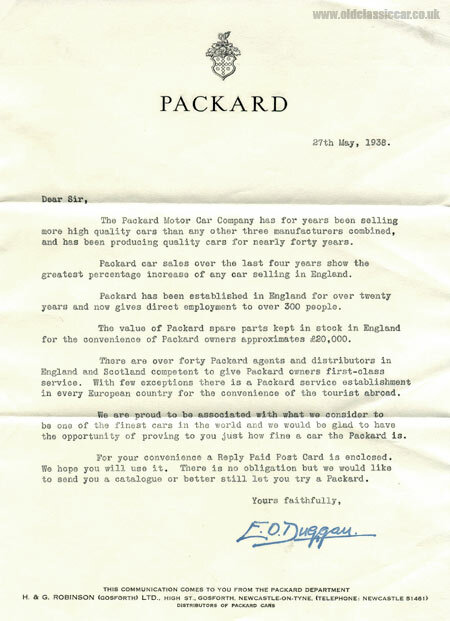 There are over forty Packard agents and distributors in England and Scotland competent to give Packard owners first-class service. With few exceptions there is a Packard service establishment in every European country for the convenience of the tourist abroad. We are proud to be associated with what we consider to be one of the finest cars in the world and we would be glad to have the opportunity of proving to you just how fine a car the Packard is. For your convenience a Reply Paid Post Card is enclosed. We hope you will use it. There is no obligation but we would like to send you a catalogue or better still let you try a Packard. This letter was sent from the Packard Department of H. & G. Robinson (Gosforth) Ltd, they were distributors of Packards in the UK from their base in Newcastle-on-Tyne. A selection of vintage & pre-war photos of Packards can be found in the vintage photo gallery - including this shot of a late 1930's 120 Series Packard, and a One-Twenty Convertible Coupe. From the 1920's, a photo of a Packard 8 fitted with E&J (Edmunds and Jones) headlamps.